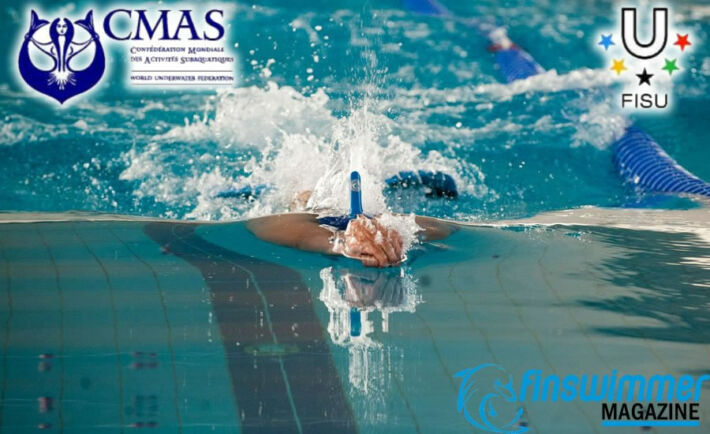 The Serbian Underwater Association with the agreement of CMAS and FISU agreement has the pleasure to invite you to the Finswimming University Competition in Belgrad from 19th to 23rd July 2018. In this Competition can participate the University Teams of National Federations affiliated to CMAS. Each team should comply with the Championship Rules, Safety Requirements set by the Organizers and all other CMAS Rules and Regulations. 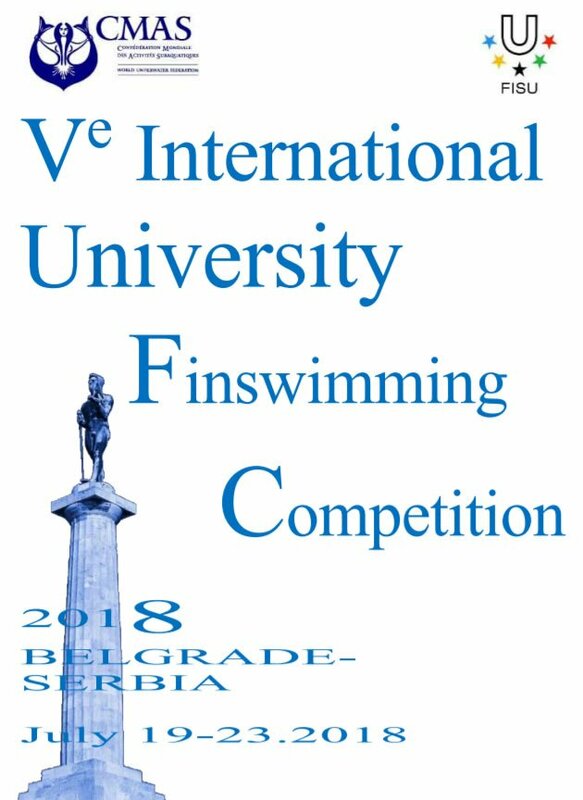 University competition in Finswimming – Belgrade 2018. The final part of a wonderful swimming week in Belgrade is the University competition in Finswimming organized by the Serbian Underwater Federation in agreement with CMAS and FISU. University Competition is held on 21 and 22 July at the pool “Milan Gale Muškatirović”. The first day of Univesity Competition was excellent for the Italian team in relay discipline (2 races and 2 medals). The medals also went to the competitors’ hands from China, Japan, Russia, and for the first time in this week in Belgrade for Mexico. Salvador Yered Badillo Enriquez won bronze for Mexico in 400m SF. One of the most successful competitors and one of the best in the world in finswimming is 24 – years old Petra Senanszky from Hungary. She won 3 medals in CMAS World Championship Finswimming Belgrade 2018 (2 gold and one bronze) but she didn’t stop. She took part in University Competition and won another gold medal in 50m Bf with score time 00:22.30. „This Univesity competition is also very important to all of us, for our sport. We have a great time in Belgrade, wonderful hosts, and we will never forget the time which we spend here. I won four medals, three gold and I am very happy and proud of that, but the most important is that we all support each other“ – told Petra. The first day of Univesity Competition we saw two relay race. First was a race of 4×100 SF W, where gold was won by China, silver went to Italy, and bronze to Colombia. In 4×50 Bf W Italy took the gold medal, silver Russia, and bronze Japan. Especially interesting was the race was the race of 800m SF W where China competitor Sijia Chen dominate, second place went to Italy Serena Monduzzi, bronze was won by Austria Eva-Maria Unger. Second and the last day of Finswimming competition in Belgrade we will see new fights for medals in University competition in discipline: 50m AP M, 50m BF M, 100m SF W, 100m BF W, 200m SF M, 200m BF M, 400m SF M, 800m SF M, 4×100 SF M, 4×50 BF M. We invite you to support the last day of one of the major sports weeks in Belgrade. We are expecting very exciting races and battles for medals. The organization of the underwater activities of the Republic of Serbia in cooperation with the CMAS and FISU at the swimming pool “Milan Gale Muškatirovic” officially closed the swimming week in Belgrade on the second day of the University Competition in Finswimming for seniors, in the capital of Serbia. More than 1,000 representatives of this sport were part of this great event. The University competition fulfilled all expectations, as well as the World Championship. It was marked by the dominance of Chinese, Russian and Italian competitors. The Japanese, the Greeks, the Czechs, and the always smiling Colombians were also brilliant. Nevertheless, one of the biggest stars on University Competiton was the representative of Hungary Petra Senanszky, who won five medals – four gold, and one bronze. At the University competition, she took two golds – 50m and 100m BF. In the men’s category, Lev Shtraikh also won four golds and one bronze. „I’m leaving Belgrade happy and proud. A city that will forever remain in my heart, because I bring five medals to Russia. A great week is behind me, I have achieved everything I wanted before coming to Serbia. The Serbs are a wonderful people, with a warm heart and great hosts. I look forward to coming to this fantastic city. Thank you for everything, “said Lev. The 20th CMAS World Championship Finswimming started on July 16th. During the four days of the indoor swimming pool “Milan Gale Muškatirović and marathon disciplines at Ada Ciganlija (swimming in open water 6000m and 4x2000m relay), the competition was attended by more than 350 competitors from 40 countries of the world. The marathon at Ada Lake finished the World Championship, but the closing speech was given by the University competition, that took place on the weekend on July 21 and 22 at Dorćol. The organization of the competition was at the highest level. “All in all, the big event is over. The past week is one of those who changed everyone’s life. Everyone from Belgrade went to their homes happy because they were part of one of the biggest world competition in Finswimming. For the first time in history, the competition was broadcast on the national TV station, also on the Olympic Channel. We are extremely pleased with the organization, as well as the picture that went from Belgrade to the world with this championship, impressions, and comments of more than 1,000 guests (competitors, their professional teams, and families) who were staying in our capital city. We believe that this is just the beginning of an era of competitions here in this sport at the international level. It is currently one of the most attractive sports in the world, it is in expansion and its time is coming. We are grateful to the State, the Ministry of Youth and Sport of the Republic of Serbia, the City of Belgrade, all the sponsors and friends who have contributed to successfully organizing a great event for our sport and Serbia “, concluded the President of Serbia Underwater Federation and member of the Executive Bureau of the CMAS, Božana Ostojić. The final word on the complete competition was put by Russian national team who won to gold medals for their country on 4x100m SF relay and 4x50m BF relay in the end of University Competition.